The 2015 Jacksonville Jaguars season was the franchise's 21st season in the National Football League and the third under head coach Gus Bradley. The Jaguars improved on their 3–13 record in 2014, finishing with a 5–11 record and winning their most games in a season since 2011. While they improved upon their previous 2 seasons, the Jaguars were eliminated from playoff contention before their Week 16 loss to the New Orleans Saints when the Houston Texans defeated the Tennessee Titans earlier in the day. S Sergio Brown, signed on March 11, 2015. CB Davon House, signed on March 11, 2015. DT Jared Odrick, signed on March 11, 2015. OT Jermey Parnell, signed on March 11, 2015. LB Dan Skuta, signed on March 11, 2015. TE Julius Thomas, signed on March 11, 2015. C Stefen Wisniewski, signed on April 18, 2015. CB Alan Ball, became free agent on March 10, 2015. Signed on March 27 by the Chicago Bears. CB Will Blackmon, released on February 26, 2015. Signed on March 10 by the Seattle Seahawks. LB Geno Hayes, became free agent on March 10, 2015. WR Cecil Shorts III, became free agent on March 10, 2015. Signed on March 16 by the Houston Texans. FB Will Taʻufoʻou, became free agent on March 10, 2015. LB J. T. Thomas, became free agent on March 10, 2015. Signed on March 10 by the New York Giants. RB Jordan Todman, became free agent on March 10, 2015. Signed on March 30 by the Carolina Panthers. K Josh Scobee, the Jaguars' all-time leading scorer, was traded to the Pittsburgh Steelers on August 31, 2015 for the Steelers' sixth round selection in the 2016 NFL Draft. The Jaguars traded their fourth-round selection (No. 103 overall) to the New York Jets for the Jets' No. 104, and No. 229 overall draft picks. Fowler tore his ACL on the first day of mini-camp and missed the entirety of his rookie season. CAR – Graham Gano 43-yard field goal, Panthers 3–0. Drive: 14 plays, 45 yards, 5:47. JAX – Jason Myers 22-yard field goal, Tied 3–3. Drive: 11 plays, 54 yards, 4:26. CAR – Jerricho Cotchery 7-yard pass from Cam Newton (Graham Gano kick), Panthers 10–3. Drive: 12 plays, 66 yards, 5:27. JAX – Rashad Greene 1-yard pass from Blake Bortles (kick failed, wide right), Panthers 10–9. Drive: 9 plays, 65 yards, 1:38. CAR – Josh Norman 30-yard interception return (Graham Gano kick), Panthers 17–9. CAR – Graham Gano 47-yard field goal, Panthers 20–9. Drive: 15 plays, 64 yards, 8:07. JAX – Allen Robinson 3-yard pass from Blake Bortles (Jason Myers kick), Jaguars 7–0. Drive: 10 plays, 82 yards, 5:39. MIA – Andrew Franks 48-yard field goal, Jaguars 7–3. Drive: 5 plays, 50 yards, 2:05. JAX – Jason Myers 27-yard field goal, Jaguars 10–3. Drive: 8 plays, 71 yards, 3:56. MIA – Andrew Franks 41-yard field goal, Jaguars 10–6. Drive: 10 plays, 56 yards, 4:36. JAX – Allen Robinson 46-yard pass from Blake Bortles (Jason Myers kick), Jaguars 17–6. Drive: 9 plays, 91 yards, 5:05. MIA – Damien Williams 10-yard pass from Ryan Tannehill (Andrew Franks kick), Jaguars 17–13. Drive: 7 plays, 82 yards, 3:15. JAX – Jason Myers 58-yard field goal, Jaguars 20–13. Drive: 3 plays, 27 yards, 0:18. MIA – Jake Stoneburner 5-yard pass from Ryan Tannehill (Andrew Franks kick), Tied 20–20. Drive: 8 plays, 80 yards, 4:32. JAX – Jason Myers 28-yard field goal, Jaguars 23–20. Drive: 9 plays, 66 yards, 1:08. NE – Dion Lewis 8-yard run (Stephen Gostkowski kick), Patriots 7–0. Drive: 5 plays, 64 yards, 1:56. NE – Stephen Gostkowski 46-yard field goal, Patriots 10–0. Drive: 10 plays, 62 yards, 4:23. JAX – Jason Myers 40-yard field goal, Patriots 10–3. Drive: 17 plays, 58 yards, 8:24. NE – Stephen Gostkowski 20-yard field goal, Patriots 13–3. Drive: 14 plays, 78 yards, 5:50. NE – Danny Amendola 1-yard pass from Tom Brady (Stephen Gostkowski kick), Patriots 20–3. Drive: 8 plays, 57 yards, 1:29. NE – Stephen Gostkowski 46-yard field goal, Patriots 23–3. Drive: 10 plays, 52 yards, 4:10. NE – LeGarrette Blount 1-yard run (Stephen Gostkowski kick), Patriots 30–3. Drive: 1 plays, 67 yards, 0:47. JAX – Allen Hurns 59-yard pass from Blake Bortles (Jason Myers kick), Patriots 30–10. Drive: 6 plays, 80 yards, 2:49. NE – Keshawn Martin 13-yard pass from Tom Brady (Stephen Gostkowski kick), Patriots 37–10. Drive: 7 plays, 80 yards, 2:57. NE – LeGarrette Blount 1-yard run (Stephen Gostkowski kick), Patriots 44–10. Drive: 5 plays, 24 yards, 1:59. NE – LeGarrette Blount 1-yard run (Stephen Gostkowski kick), Patriots 51–10. Drive: 17 plays, 58 yards, 9:47. JAX – Clay Harbor 59-yard pass from Blake Bortles (Jason Myers kick), Patriots 51–17. Drive: 7 plays, 80 yards, 2:09. IND – Adam Vinatieri 54-yard field goal, Colts 3–0. Drive: 12 plays, 55 yards, 5:26. JAX – Jason Myers 20-yard field goal, Tied 3–3. Drive: 6 plays, 78 yards, 2:10. JAX – Allen Hurns 8-yard pass from Blake Bortles (Jason Myers kick), Jaguars 10–3. Drive: 4 plays, 44 yards, 2:00. IND – Coby Fleener 2-yard pass from Matt Hasselbeck (Adam Vinatieri kick), Tied 10–10. Drive: 13 plays, 80 yards, 5:33. JAX – Jason Myers 32-yard field goal, Jaguars 13–10. Drive: 14 plays, 65 yards, 6:00. IND – Adam Vinatieri 32-yard field goal, Tied 13–13. Drive: 8 plays, 35 yards, 4:05. IND – Adam Vinatieri 26-yard field goal, Colts 16–13. Drive: 6 plays, 53 yards, 3:37. TB – Connor Barth 35-yard field goal, Buccaneers 3–0. Drive: 9 plays, 62 yards, 4:44. JAX – Allen Hurns 12-yard pass from Blake Bortles (Jason Myers kick), Jaguars 7–3. Drive: 10 plays, 78 yards, 5:10. TB – Connor Barth 45-yard field goal, Jaguars 7–6. Drive: 7 plays, 53 yards, 3:41. TB – Doug Martin 10-yard pass from Jameis Winston (Connor Barth kick), Buccaneers 13–7. Drive: 3 plays, 17 yards, 1:33. TB – Doug Martin 1-yard run (Connor Barth kick), Buccaneers 20–7. Drive: 6 plays, 41 yards, 3:26. JAX – Allen Robinson 13-yard pass from Blake Bortles (Jason Myers kick), Buccaneers 20–14. Drive: 7 plays, 78 yards, 1:50. JAX – Jason Myers 31-yard field goal, Buccaneers 20–17. Drive: 11 plays, 50 yards, 4:57. JAX – T.J. Yeldon 5-yard pass from Blake Bortles (Jason Myers kick), Jaguars 24–20. Drive: 6 plays, 61 yards, 3:22. TB – Connor Barth 47-yard field goal, Jaguars 24–23. Drive: 7 plays, 51 yards, 2:28. TB – Jacquies Smith 3-yard fumble return (Jameis Winston to Vincent Jackson pass succeeded), Buccaneers 31–24. TB – Doug Martin 1-yard run (Connor Barth kick), Buccaneers 38–24. Drive: 8 plays, 40 yards, 5:01. JAX – Allen Robinson 5-yard pass from Blake Bortles (Jason Myers kick), Buccaneers 38–31. Drive: 7 plays, 86 yards, 1:45. HOU – Arian Foster 14-yard pass from Brian Hoyer (Nick Novak kick), Texans 7–0. Drive: 16 plays, 99 yards, 8:24. JAX – Allen Robinson 2-yard pass from Blake Bortles (Jason Myers kick), Tied 7–7. Drive: 14 plays, 75 yards, 6:55. HOU – Nick Novak 41-yard field goal, Texans 10–7. Drive: 9 plays, 55 yards, 3:03. JAX – Julius Thomas 29-yard pass from Blake Bortles (Jason Myers kick), Jaguars 14–10. Drive: 4 plays, 52 yards, 1:32. HOU – DeAndre Hopkins 9-yard pass from Brian Hoyer (Nick Novak kick), Texans 17–14. Drive: 9 plays, 81 yards, 3:45. HOU – DeAndre Hopkins 26-yard pass from Brian Hoyer (Nick Novak kick), Texans 24–14. Drive: 4 plays, 46 yards, 1:18. HOU – Andre Hal 31-yard interception return (Nick Novak kick), Texans 31–14. JAX – Allen Hurns 11-yard pass from Blake Bortles (kick failed, wide left), Texans 31–20. Drive: 12 plays, 80 yards, 3:23. BUF – Dan Carpenter 31-yard field goal, Bills 3–0. Drive: 7 plays, 43 yards, 2:38. JAX – Allen Robinson 10-yard pass from Blake Bortles (Jason Myers kick), Jaguars 7–3. Drive: 7 plays, 73 yards, 3:08. JAX – Chris Clemons 6-yard fumble return (Jason Myers kick), Jaguars 14–3. JAX – Telvin Smith 26-yard interception return (Jason Myers kick), Jaguars 21–3. JAX – T.J. Yeldon 28-yard run (kick failed, wide right), Jaguars 27–3. Drive: 3 plays, 36 yards, 1:30. BUF – Robert Woods 16-yard pass from EJ Manuel (Dan Carpenter kick), Jaguars 27–10. Drive: 12 plays, 85 yards, 5:39. BUF – Dan Carpenter 38-yard field goal, Jaguars 27–13. Drive: 7 plays, 30 yards, 1:30. BUF – Dan Carpenter 26-yard field goal, Jaguars 27–16. Drive: 14 plays, 91 yards, 5:40. BUF – Marcus Easley 58-yard pass from EJ Manuel (LeSean McCoy run), Jaguars 27–24. Drive: 2 plays, 52 yards, 0:42. BUF – Corey Graham 44-yard interception return (Dan Carpenter kick), Bills 31–27. JAX – Allen Hurns 31-yard pass from Blake Bortles (Jason Myers kick), Jaguars 34–31. Drive: 7 plays, 84 yards, 3:05. JAX – Jason Myers 45-yard field goal, Jaguars 3–0. Drive: 10 plays, 29 yards, 5:03. NYJ – Eric Decker 7-yard pass from Ryan Fitzpatrick (Ryan Quigley kick), Jets 7–3. Drive: 6 plays, 51 yards, 3:51. NYJ – Chris Ivory 1-yard run (Ryan Quigley kick), Jets 14–3. Drive: 6 plays, 31 yards, 2:43. JAX – Allen Hurns 30-yard pass from Blake Bortles (Jason Myers kick), Jets 14–10. Drive: 2 plays, 50 yards, 0:12. JAX – Jason Myers 39-yard field goal, Jets 14–13. Drive: 5 plays, 23 yards, 1:43. NYJ – Chris Ivory 1-yard run (Ryan Quigley kick), Jets 21–13. Drive: 8 plays, 73 yards, 2:30. JAX – Jason Myers 35-yard field goal, Jets 21–16. Drive: 9 plays, 73 yards, 2:55. NYJ – Brandon Marshall 20-yard pass from Ryan Fitzpatrick (Ryan Quigley kick), Jets 28–16. Drive: 3 plays, 25 yards, 0:56. JAX – Bryan Walters 20-yard pass from Blake Bortles (Jason Myers kick), Jets 28–23. Drive: 3 plays, 72 yards, 0:25. JAX – Allen Hurns 5-yard pass from Blake Bortles (Jason Myers kick), Jaguars 7–0. Drive: 8 plays, 65 yards, 4:20. BAL – Crockett Gillmore 10-yard pass from Joe Flacco (Justin Tucker kick), Tied 7–7. Drive: 2 plays, 26 yards, 0:45. JAX – Jason Myers 21-yard field goal, Jaguars 10–7. Drive: 15 plays, 77 yards, 8:04. BAL – Maxx Williams 21-yard pass from Joe Flacco (Justin Tucker kick), Ravens 14–10. Drive: 7 plays, 80 yards, 2:17. JAX – Jason Myers 45-yard field goal, Ravens 14–13. Drive: 3 plays, 0 yards, 0:24. JAX – Allen Robinson 15-yard pass from Blake Bortles (pass failed), Jaguars 19–14. Drive: 5 plays, 37 yards, 1:00. BAL – Chris Givens 14-yard pass from Joe Flacco (pass failed), Ravens 20–19. Drive: 10 plays, 80 yards, 5:31. JAX – Jason Myers 53-yard field goal, Jaguars 22–20. Drive: 8 plays, 45 yards, 1:06. TEN – Ryan Succop 47-yard field goal, Titans 3–0. Drive: 10 plays, 51 yards, 5:54. JAX – Jason Myers 31-yard field goal, Tied 3–3. Drive: 11 plays, 73 yards, 5:30. TEN – Ryan Succop 49-yard field goal, Titans 6–3. Drive: 9 plays, 48 yards, 3:52. JAX – Jason Myers 32-yard field goal, Tied 6–6. Drive: 5 plays, 36 yards, 0:55. JAX – Jason Myers 20-yard field goal, Jaguars 9–6. Drive: 13 plays, 78 yards, 6:50. TEN – Marcus Mariota 23-yard run (Ryan Succop kick), Titans 13–9. Drive: 5 plays, 81 yards, 2:48. JAX – Julius Thomas 5-yard pass from Blake Bortles (Jason Myers kick), Jaguars 16–13. Drive: 1 play, 5 yards, 0:04. JAX – Jason Myers 36-yard field goal, Jaguars 19–13. Drive: 4 plays, 9 yards, 1:00. JAX – Jason Myers 22-yard field goal, Jaguars 3–0. Drive: 10 plays, 76 yards, 4:21. JAX – Jason Myers 51-yard field goal, Jaguars 6–0. Drive: 8 plays, 53 yards, 3:41. SD – Dontrelle Inman 2-yard pass from Philip Rivers (Josh Lambo kick), Chargers 7–6. Drive: 7 plays, 63 yards, 1:37. JAX – Jason Myers 27-yard field goal, Jaguars 9–6. Drive: 6 plays, 36 yards, 2:02. SD – Antonio Gates 9-yard pass from Philip Rivers (Josh Lambo kick), Chargers 14–9. Drive: 13 plays, 83 yards, 5:14. SD – Antonio Gates 12-yard pass from Philip Rivers (Josh Lambo kick), Chargers 21–9. Drive: 3 plays, 22 yards, 0:16. JAX – Jason Myers 28-yard field goal, Chargers 21–12. Drive: 7 plays, 33 yards, 2:27. SD – Josh Lambo 28-yard field goal, Chargers 24–12. Drive: 13 plays, 56 yards, 6:30. JAX – Julius Thomas 21-yard pass from Blake Bortles (Jason Myers kick), Chargers 24–19. Drive: 12 plays, 80 yards, 5:04. SD – Steve Johnson 5-yard pass from Philip Rivers (Josh Lambo kick), Chargers 31–19. Drive: 14 plays, 80 yards, 6:13. JAX – Allen Robinson 8-yard pass from Blake Bortles (kick failed, wide right), Chargers 31–25. Drive: 2 plays, 14 yards, 0:09. TEN – Craig Stevens 10-yard pass from Marcus Mariota (Ryan Succop kick), Titans 7–0. Drive: 12 plays, 80 yards, 6:38. JAX – Rashad Greene 2-yard pass from Blake Bortles (kick failed, wide right), Titans 7–6. Drive: 10 plays, 75 yards, 4:19. TEN – Delanie Walker 7-yard pass from Marcus Mariota (Ryan Succop kick), Titans 14–6. Drive: 10 plays, 90 yards, 6:11. JAX – T.J. Yeldon 1-yard run (pass failed), Titans 14–12. Drive: 8 plays, 66 yards, 3:45. TEN – Antonio Andrews 1-yard run (Ryan Succop kick), Titans 21–12. Drive: 9 plays, 75 yards, 1:50. JAX – Allen Robinson 1-yard pass from Blake Bortles (Jason Myers kick), Titans 21–19. Drive: 14 plays, 64 yards, 7:33. TEN – Dorial Green-Beckham 47-yard pass from Marcus Mariota (Ryan Succop kick), Titans 28–19. Drive: 9 plays, 80 yards, 5:03. JAX – Allen Robinson 8-yard pass from Blake Bortles (kick failed, wide left), Titans 28–26. Drive: 6 plays, 80 yards, 2:57. JAX – Julius Thomas 9-yard pass from Blake Bortles (Jason Myers kick), Jaguars 32–28. Drive: 1 play, 9 yards, 0:04. TEN – Marcus Mariota 87-yard run (Ryan Succop kick), Titans 35–32. Drive: 3 plays, 90 yards, 1:39. TEN – Wesley Woodyard 3-yard fumble return (Ryan Succop kick), Titans 42–32. JAX – Allen Robinson 5-yard pass from Blake Bortles (Jason Myers kick), Titans 42–39. Drive: 4 plays, 80 yards, 1:18. JAX – Jason Myers 46-yard field goal, Jaguars 3–0. Drive: 9 plays, 52 yards, 3:43. IND – Adam Vinatieri 25-yard field goal, Tied 3–3. Drive: 7 plays, 73 yards, 3:30. IND – Adam Vinatieri 21-yard field goal, Colts 6–3. Drive: 10 plays, 65 yards, 4:22. IND – Robert Mathis fumble recovery in the end zone (Adam Vinatieri kick), Colts 13–3. JAX – Andre Branch 58-yard fumble return (kick failed, wide right), Colts 13–9. JAX – Allen Hurns 80-yard pass from Blake Bortles (Jason Myers kick), Jaguars 16–13. Drive: 1 play, 80 yards, 0:12. JAX – Rashad Greene 73-yard punt return (Jason Myers kick), Jaguars 23–13. IND – Adam Vinatieri 33-yard field goal, Jaguars 23–16. Drive: 10 plays, 66 yards, 4:11. JAX – Allen Robinson 4-yard pass from Blake Bortles (Jason Myers kick), Jaguars 30–16. Drive: 8 plays, 80 yards, 2:47. JAX – Julius Thomas 3-yard pass from Blake Bortles (Jason Myers kick), Jaguars 37–16. Drive: 10 plays, 69 yards, 5:58. 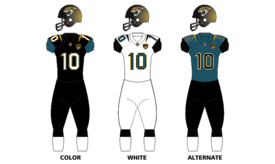 JAX – Denard Robinson 1-yard run (Jason Myers kick), Jaguars 44–16. Drive: 7 plays, 57 yards, 5:12. JAX – Blake Bortles 1-yard run (Jason Myers kick), Jaguars 51–16. Drive: 4 plays, 1 yard, 2:07. ATL – Devonta Freeman 5-yard run (Shayne Graham kick), Falcons 7–0. Drive: 8 plays, 80 yards, 4:12. JAX – Jason Myers 42-yard field goal, Falcons 7–3. Drive: 9 plays, 68 yards, 3:23. ATL – Julio Jones 11-yard pass from Matt Ryan (Shayne Graham kick), Falcons 14–3. Drive: 11 play, 81 yards, 5:41. ATL – Shayne Graham 34-yard field goal, Falcons 17–3. Drive: 1 play, 0 yards, 0:02. JAX – Blake Bortles 1-yard run (Jason Myers kick), Falcons 17–10. Drive: 9 plays, 80 yards, 4:20. JAX – Allen Robinson 10-yard pass from Blake Bortles (Jason Myers kick), Tied 17–17. Drive: 6 plays, 39 yards, 3:30. ATL – Shayne Graham 33-yard field goal, Falcons 20–17. Drive: 7 plays, 47 yards, 2:56. ATL – Shayne Graham 46-yard field goal, Falcons 23–17. Drive: 14 plays, 41 yards, 6:44. NO – Michael Hoomanawanui 17-yard pass from Drew Brees (Kai Forbath kick), Saints 7–0. Drive: 10 plays, 80 yards, 4:27. NO – Brandin Cooks 71-yard pass from Drew Brees (Kai Forbath kick), Saints 14–0. Drive: 9 plays, 98 yards, 6:20. NO – Tim Hightower 1-yard run (Kai Forbath kick), Saints 21–0. Drive: 5 plays, 43 yards, 2:42. NO – Kai Forbath 37-yard field goal, Saints 24–0. Drive: 8 plays, 27 yards, 3:00. JAX – Marqise Lee 2-yard pass from Blake Bortles (pass failed), Saints 24–6. Drive: 8 plays, 80 yards, 2:33. JAX – Allen Hurns 6-yard pass from Blake Bortles (Jason Myers kick), Saints 24–13. Drive: 11 plays, 80 yards, 6:09. NO – Travaris Cadet 44-yard pass from Drew Brees (Kai Forbath kick), Saints 31–13. Drive: 7 plays, 80 yards, 3:22. JAX – Allen Robinson 90-yard pass from Blake Bortles (pass failed), Saints 31–19. Drive: 1 play, 80 yards, 0:40. NO – Tim Hightower 5-yard run (Kai Forbath kick), Saints 38–19. Drive: 13 plays, 88 yards, 6:50. JAX – Allen Hurns 20-yard pass from Blake Bortles (Blake Bortles to Clay Harbor pass succeeded), Saints 38–27. Drive: 9 plays, 80 yards, 1:34. HOU – Nick Novak 29-yard field goal, Texans 3–0. Drive: 8 plays, 47 yards, 3:30. HOU – Jonathan Grimes 12-yard pass from Brian Hoyer (Nick Novak kick), Texans 10–0. Drive: 10 plays, 79 yards, 4:33. JAX – Justin Myers 43-yard field goal, Texans 10–3. Drive: 8 plays, 55 yards, 4:01. HOU – Johnathan Grimes 1-yard run (Nick Novak kick), Texans 17–3. Drive: 6 plays, 42 yards, 2:17. HOU – Nick Novak 51-yard field goal, Texans 20–3. Drive: 8 plays, 42 yards, 1:08. JAX – Justin Myers 34-yard field goal, Texans 20–6. Drive: 4 plays, -3 yards, 1:51. HOU – Nick Novak 51-yard field goal, Texans 23–6. Drive: 11 plays, 42 yards, 5:52. HOU – Kareem Jackson 27-yard interception return (Nick Novak kick), Texans 30–6. 1 2 3 Denver finished ahead of New England and Cincinnati for the No. 1 seed based on head-to-head sweep. New England finished ahead of Cincinnati for the No. 2 seed based on record vs. common opponents — New England's cumulative record against Buffalo, Denver, Houston and Pittsburgh was 4–1, while Cincinnati's cumulative record against the same four teams was 2–3. 1 2 Pittsburgh finished ahead of the New York Jets for the No. 6 seed and qualified for the last playoff spot based on record vs. common opponents — Pittsburgh's cumulative record against Cleveland, Indianapolis, New England and Oakland was 4–1, while the Jets' cumulative record against the same four teams was 3–2. 1 2 3 4 5 6 The tiebreaker was based on head-to-head victory. 1 2 3 4 5 6 Oehser, John. "'15 free agency: Thomas, Odrick, Parnell, Skuta, House, Brown finalize deals". Jaguars.com. Retrieved 11 March 2015. ↑ DiRocco, Mike. "Jaguars trade kicker Josh Scobee to Steelers". ESPN.com. Retrieved 23 October 2015. ↑ Payne, Marissa (May 8, 2015). "Jaguars first-round pick Dante Fowler reportedly out for season after injuring knee". The Washington Post. Retrieved May 8, 2015. ↑ Wilhalme, Matt (May 8, 2015). "Video: Jaguars first-rounder Dante Fowler Jr. tears ACL in practice". The Los Angeles Times. Retrieved May 8, 2015.